George Takei is a science fiction icon for his portrayal of Hikaru Sulu, the helmsman of the USS Enterprise on Star Trek. While that one role could easily have been his defining moment, there is so, so much more to him than his work on TV and in film. He’s become an outspoken activist for both the Asian and LGBT communities, a meme-producing force on Facebook, and a—finally legally acknowledged—husband to boot. 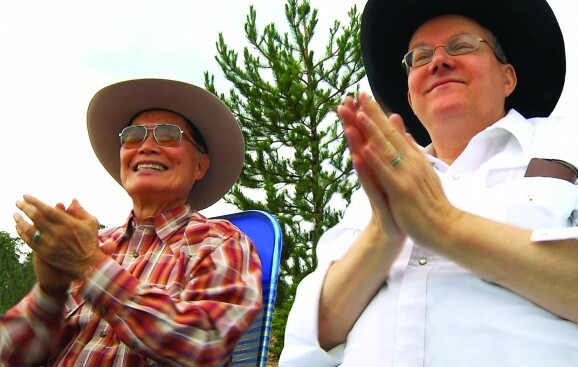 Jennifer Kroot’s new documentary, To Be Takei, offers a hilarious, agreeable, ultimately very intimate look into his life. Kroot’s cameras follow Takei and Brad, his partner of more than 25-years, as they bounce around the country, from comic book and science fiction conventions, to appearances on the radio with Howard Stern, and even to big time political events. In a perpetual state of motion, the two opposite personality types—Brad is fastidious and detail-oriented, while George is more free flowing and sarcastic—mesh almost perfectly. Sharing everything, both personal and professional, Kroot paints the sweetest, most adorable portrait imaginable. From this current narrative thread, To Be Takei dips back into his turbulent past, in which he experienced, first hand, some of the darkest chapters in American history. As a young child, during World War II, Takei and his entire family, along with 100,000 other Japanese-Americans, were imprisoned in internment camps. They had their property seized and assets frozen, despite the fact that there was never a single incident of one of these citizens aiding the Japanese war effort. Traumatizing as this was, and though it affected his entire life—as the cameras follow him, he works on a stage play that revolves around his experiences with internment—coloring everything that came after, Takei never allowed himself to sink into bitterness. Instead, he decided to help head the charge to redress this egregious wrong. In reality, these experiences are responsible for sparking off Takei’s lifelong quest for social justice and equal rights for everyone. Takei was never a superstar actor—though you see how popular and beloved he still is during the convention scenes—but he parlayed that into the role of Sulu when Gene Roddenberry came knocking. For an actor who often had to compromise himself, playing a variety of racist stereotypes in small parts just to find any work at all, joining an intentionally diverse, eclectic cast was a dream. Not only was he an Asian-American face on your TV every week, but one shown in a positive light, something all too rare, especially at the time. But even as he found success in his professional life, extending that influence into a variety of political causes, Takei still had to hide his sexual orientation—he’s very adamant about the term orientation versus lifestyle. He even pauses while he and Brad are in the process of scattering Brad’s mother’s ashes in a scene that, if it were scripted, would be straight out of The Big Lebowski. What could have played for slapstick and humor, turns into a gentle, earnest moment that illustrates how deep their connection runs. The film captures the chaotic nature of Takei’s life, but also documents the intense joy that he finds in every avenue he travels down, never one to shy away from controversy or speaking his mind. Familiar faces pop up throughout, including Takei’s old Trek crewmates like Leonard Nimoy, and Nichelle Nichols and Walter Koenig—both of whom actually took part in George and Brad’s wedding ceremony. Sprinkled in throughout are hilarious bits with William Shatner, who comes across as a total jag, where he denies that the two were ever friends, and is obviously super uncomfortable discussing his co-star’s homosexuality. As a documentary, To Be Takei doesn’t break any new ground or push the boundaries of the form, but it does provide an in depth, personal glimpse behind the public persona. Takei is engaging, welcoming, and forthcoming when discussing every aspect of his life, no matter how painful. You walk away from this with the feeling that you just spend 90-minutes hanging out with the man, and that is a damn good time. 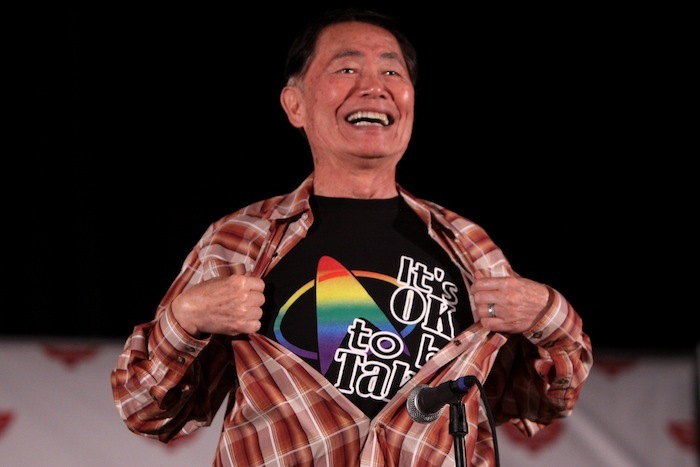 To Be Takei premiered at Sundance, has played numerous other film festivals, and hits theaters on August 22.